Sizzle this season in a top that lets you show what's in the back. This easy to pair top makes keeping chic an easy feat. Just grab and go. 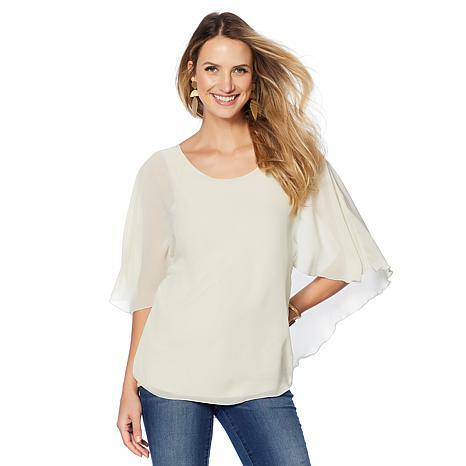 This top is so flattering and beautiful, I can hardly believe how comfortable it is! Love it! I love this top!! Have both black and white ! Make it in more colors please! !Thanks Rhonda love all of your stuff!! Fabulous choice! Comfortable , feminine, and a little racy!! Loved the feel and fit.Received many compliments first time I wore it. Runs large. The color Ivory looked strange. It washed out my olive skin. I looked drab. The blouse looks better on a hangar than it did on me. Didn't look good on me. Would look better on larger person. Wish she sold it in a petite size.